Our first visit to Alamanda is on the eve of Christmas. Had a great shopping experience and was worth the long journey there. We reached at about 2.00pm. There was a good crowd. Carrefour, Parkson and "the fresh food people" a.k.a. Cold Storage are the anchor tenants. Cinemas and bowling alleys are located below the food court. There is this one section where a couple of eateries are side by side and overlooking a small lake. Good food with good view. Love that! Another section has a huge bamboo garden.. very soothing to the eyes. Overall this mall is just the right size, right mix of tennants, bright and comfortable. You won't feel totally exhausted after walking the entire mall and yet you can get everything here. Agnes was shopping for apparels at Esprit. Prices in this outlet seem reasonable but it took her a long time to decide. So I went out to the nearby food court and bought a burger. Taste really good as I was hungry. When she was done with Esprit, we went to Watson to get vitamins. Later we walked into Nichii. This fashion house offers a variety of garments that suits Agnes. At the paying counter, as the bill amount gets higher... we began to have interest on the promotion that is going on in Alamanda. Its called "Holiday on us". With the purchase of RM800 (acummulated receipts allowed) in a single day, you can redeem 1 international and 1 local holiday package. International holiday pakage is 5d4n either Bali or Phuket. 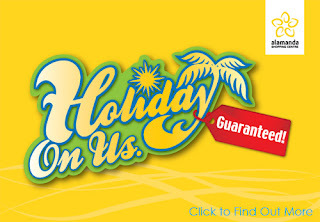 Local holiday package is 3d2n choices are Cherating, Kuantan, Perhentian, PD, Genting & Penang. Validity of travel 1 year. Accomodation & airport transfer only - flight tickets not included. What a deal! We decided to go for it. But after adding all our purchases we are just about half way. As we were thinking what to buy to reach RM800, Agnes came up with a brilliant idea. Haha.. milk powder for our 18month boy. Its something that we have to buy sooner or later. Checked the price at Cold Storage and it was few ringgit higher. Ah! what the heck. Our minds were clouded. Only thinking of Bali and Phuket. So we bought 4 tins of milk powder which will last for 4 months and redeemed the "Holiday on us" package. 2010... most likely it will be Phuket and Cherating. Hopefully the holiday packages will not be too far off from our expectation. The promotion ends 31 December 2009. Anyone who is interested still has time.